The Forms unique melodic post-shoegaze songs translate well in an outdoor Summer setting. Their performance at the After The Jump Festival in June was well received but unfortunately, they had to split the audience with the concurrent amazing indoor performance by Ponytail. When we last saw and recorded The Forms it was last Summer in an opening slot for The National in the rain at the Seaport. The setlist at After the Jump was primarily material from their excellent Fall of 2007 release of The Forms (Rebel Music), and the band appeared more mature and confident than last year. We recorded this set from the identical location and equipment as the Pela recording. The quality is quite excellent. Enjoy! 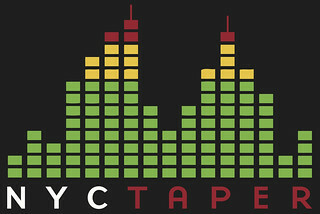 If you email nyctaper for access to this recording, we expect that you will PLEASE SUPPORT The Forms, visit their website, visit their MySpace page, and purchase their official releases from links at their MySpace page.